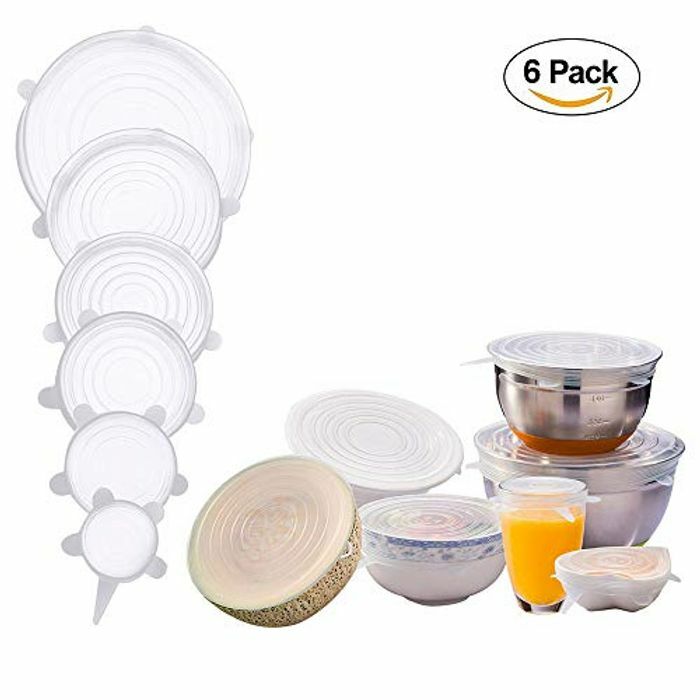 【Health & Safety】 Non-toxic material, keeps the food fresh, you can simply put the Silicone Lid on to cover your food and heat it up in the oven or microwave. 【Cold & Heat Resistant】 Feel free to place the stretchable food lid in the refrigerator or even in a microwave and dishwasher. Since the silicone material resists low temperatures and high temperatures (up to 450 °F), the bowl-shaped stretch cap will remain intact and remain in good condition for long periods of time. 【Enjoy The Tight Seal】 Silicone tops are round and smooth, which is stretchy enough to fit snugly over odd-shaped mugs, pots, cups and bowls to prevent spilling while keeping your food fresher. There are lots of handy tabs all around the lid, making it easier to be removed from container. 【Eco-friendly & Economical】 Silicone stretch cover will reduce your plastic waste and help you save money because you will no longer need to buy cellophane to cover the remaining food. In addition, the bowl lid is better for keeping food fresh! 【Application】 Seeing through the clear silicone cover, it is easy for you to find the vegetables or other food that you're looking for. Cover containers of different shapes and sizes, including: bowl, glassware, jar, food can, watermelon, pineapple, cantaloupe or other fruits and vegetables. ☆ Find a silicone stretch lid which is smaller than the bowl. ☆ Cover the bowl and hold one side, then stretch another side to fit the bowl. ☆ Adjust the lid and make sure it's sealed. ☆ Clean lids and keep them dry before the first use and after each use. ☆ Clean lids with soap and hot water or put in the dishwasher. Avoid abrasive or force-foam cleaners. ☆ Lids can be used in the microwave or oven, but are not suitable for placing on the gas or electricity directly for heating. ☆ Wash the lids after cool once heated in the microwave or oven to prolong the service life. ☆ You had better not completely seel container when you are using in Microwave or Oven, because the expanding heat and pressure from container, may result in damage or injury. Got these for £3.82 great idea don't need to use so much foil know.